AYPC Services – Page 2 – All about Tech! Google Chrome 74 offers a built-in dark mode on Windows. Rather than having its own dark mode toggle, Chrome simply follows Windows 10’s overall app mode. That’s how it normally works—but there’s a way to forcibly enable it, too. 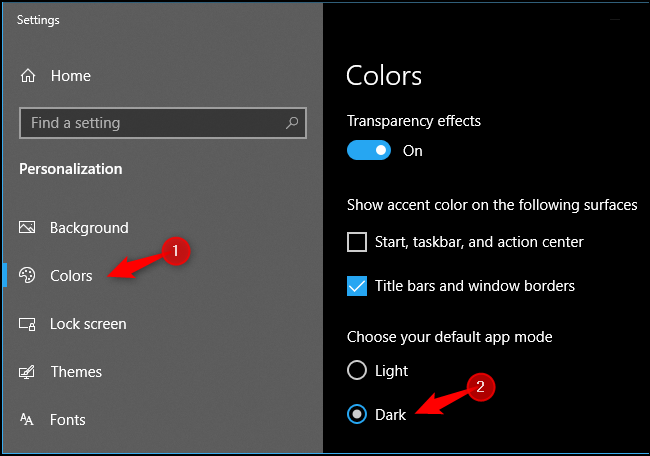 You can simply enable Google Chrome’s built-in dark mode by heading to Settings > Personalization > Colors and choosing “Dark” under “Choose your default app mode.” Windows 10 will turn dark and Chrome, along with some other applications, will follow this overall setting. On a Mac, you can enable macOS’s dark mode to achieve the same thing. For now, this only works for some people. As of Chrome 74’s release on April 23, 2019, Google is testing this feature with “a small number of Chrome M74 users” and “it will become more widely available in the near future” according to a Chrome community manager. To enable it now, you can launch Chrome with the --force-dark-mode option. To activate this option, find the shortcut you normally use to launch Chrome. For example, it might be on your taskbar or desktop. We’ll use the taskbar shortcut. If you use the online version of Outlook, you can delete your email search history (useful if you’ve got privacy concerns) or export it (useful for finding old searches or data analysis). Here’s how to do it. 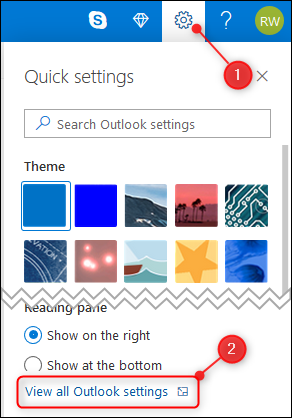 Most users of Outlook.com should have the modern look and feel for their email account now, which by default shows an all blue bar. If you’ve still got the classic version, which a lot of enterprise versions (the work email provided by your company) are still using, it’ll show a primarily black bar by default. Either way, the process is generally the same, but the location of the settings is slightly different. G Suite is a collection of enterprise-based products—like Gmail, Drive, Docs, Sheets, and so on—offered by Google via a monthly subscription platform to help streamline your business. But what’s the difference between it and the free apps? G Suite—formerly known as Google Apps for Work—is a Software as a Service (SaaS) product that groups all the cloud-based productivity and collaboration tools developed by Google for businesses, institutes, and nonprofits. Included with every subscription you get access to custom Gmail addresses, Docs, Sheets, Slides, Calendar, Drive, Sites, and so much more. What’s the Difference Between G Suite and Free Google Apps? It might seem like a lot of the same Google apps are available for free, but there are a few key features that help G Suite integrate with your company perfectly. While most of these products are free for everyone, G Suite adds enterprise-level features for its subscribers. Some of these features include shared calendars, optional unlimited cloud storage, advanced admin controls—like add and remove users, two-step verification, and single-sign-on—and simple data migration tools to transfer all your company’s valuable data to G Suite. Plus, G Suite comes with mobile device management, letting you activate/deactivate mobile devices, control which apps are enabled, and remote wipe if the employee goes rogue with a company device. Note: You must already own and verify the domain that you’re signing up with to use it with G Suite. If you love buying from Amazon but hate dealing with returns, life is going to get a lot easier starting in July: Amazon and Kohl’s announced an extended partnership that will allow all Kohl’s stores to accept Amazon returns. This isn’t exactly a new program for the pair—there were initially 100 Kohl’s stores across the country that were able to accept Amazon returns. But in July, that is being expanded to all 1,150 Kohl’s location in the US. This is a pretty brilliant move for both companies. I have friends who don’t like shopping online because if they order the wrong thing, they hate dealing with shipping returns. This solves that issue. But at the same time, it’s a huge win for Kohl’s, because it simply gets more people through the door. As pointed out by TechCrunch, Kohl’s has seen increased traffic—and more importantly, revenue—in the 100 stores that initially accepted Amazon returns. Come in to return something, end up leaving with some new kicks. Sneaky, sneaky. Of course, this extended partnership also comes on the heels of another recent collaboration between the two companies that saw Kohl’s include Amazon-branded products (like Echo speakers) in 200 of its stores. Some Kohl’s stores also feature an “Amazon Smart Home Experience” to show users what Echo devices are capable of. That’s another good idea. With online sales continually chipping away at the number of people willing to get in their car and walk into a store, supporting partnering with Amazon is an incredibly smart move for Kohl’s. It’s a win-win-win for Amazon, Kohl’s, and customers. Really, your wallet may be the only loser in this partnership. In other news, iFixit thinks it found why Galaxy Folds are failing, Verizon wants you to buy YouTube TV, Apple started an Apple TV YouTube channel, and more. Now, let’s talk about something a little more serious: shopping carts. They’re part of everyone’s life (unless you only shop on Amazon—speaking of which, did you know that Kohl’s will start taking Amazon returns soon?) and they’re kind of annoying. Imagine with me, if you will, a world where shopping carts were…better. One where they were able to stop themselves in an emergency. That’s the world Ford wants us to live in. The company developed a safer shopping cart—one designed to save the shins of countless users, shelves, or anything else that it may run into. Using the same technologies that Ford uses in its cars, the cart will be packed with sensors to detect obstacles and slow itself down when an imminent impact is detected.